Micajah and Wiley Harpe (known respectively as "Big" and "Little" Harpe) spread misery and terror through the western frontier in the late 1790s. They took what they wanted and recognized no law, leaving a trail of death and destruction through Kentucky and Tennessee, and into the Natchez Trace. The Harpes had declared war on humanity, killing men, women, and children indiscriminately; estimated to be responsible for 25-40 murders during a two year period. The Harpes are considered by many to be the first recorded serial killers in American history. Though they were known as the Harpe brothers, Micajah and Wiley Harpe were first cousins, sons of William and Joshua Harpe, who had come from Scotland and settled in North Carolina. During the American Revolution Micajah and Wiley fought with the Chickamauga Indians on the side of England against the American rebels. As loyalists, they were forced to flee their homes after the American victory and they moved to the Knoxville area of Tennessee. In 1797 Little Harpe (then in his late twenties or early thirties) married a “pretty and delicate” woman about 20 years old named Sarah “Sally” Rice. Not to be outdone, Big Harpe came home with two wives—his legal wife, Susannah Roberts, described as “rather tall, rawboned, dark hair and eyes and rather ugly” and his “subordinate” wife, Susannah's sister Betsy, described as “rather handsome, light hair and blue eyes and a perfect contrast with her sister.” The five settled in together in a cabin outside of Knoxville. Not long after, horses and other livestock began to disappear from neighboring farms. At the same time, the Harpes became known for supplying local stores with pork and mutton. In 1798 Edward Tiel tracked his missing horses to the Harpe cabin. The cabin was empty so Tiel and a number of companions continued tracking until they overtook the Harpes with the stolen horses. The Harpes surrendered but escaped before they could be taken to Knoxville. The Harpe women would later call this the turning point when their men “declared war on all mankind.” They first began burning stables belonging to prominent Knoxville citizens and robbing their houses during the chaos, but soon they turned to murder. They seized a man named Johnson from a Knoxville tavern and a few days later his body was found, gutted and filled with stones, in the Holston River. The Harpes and their women fled north to Kentucky and began a murderous rampage. They robbed and murdered a peddler named Peyton near the Cumberland River. On the road they met two travelers named Paca and Bates and persuaded them to travel with them for safety. The Harpes shot the two men from horseback. Bates died instantly but Big Harpe had to finish off Paca with his tomahawk. Gaining the trust of susceptible victims became the Harpe’s modus operandi. They were known to burn down houses and murder the inhabitants leaving with nothing more than they would have obtained from the simple hospitality of the homeowners. They murdered a young slave—smashed his head against a tree—and left behind his horse and the grain he had been carrying. In one case the Harpe family’s breakfast bill at a tavern was paid for by a traveler named Thomas Lankford. Lankford was later robbed and murdered by tomahawk about ten miles from the tavern. The Harpes were immediately suspected. They were overtaken and arrested in Hustonville, Kentucky on Christmas Day 1798. All three Harpe women were pregnant at the time of the arrest and two gave birth in prison that winter but the family did not stay together long; Big and Little Harpe escaped jail on March 16, 1799. The women were later acquitted of the murders and eventually rejoined their men. The fugitives were pursued by a posse led by “Devil Joe” Ballenger, and a reward was placed on their heads, but the Harpes' murder spree continued in Kentucky. The body of Johnny Trabue, son of Revolutionary War veteran Col. Daniel Trabue, was found dismembered near a grist mill. He had been butchered for a sack of flour. Frederick Stump, Jr. was hunting on his farm when the Harpes slit his throat and stole his rifle. His corpse bore the Harpe’s signature: gutted and filed with stones in the Barren River. The Harpes traveled as far north as Cave-In-Rock, Illinois—literally a cave in the rocks inhabited by river pirates. Allegedly the other outlaws were so appalled by the behavior of the Harpes, that they drove them out of the cave and back to Kentucky. In one notable incident the Harpes impersonated Methodist ministers and went to the house of Moses Stegall. Stegall worked both sides of the law and he and his wife knew the Harpes from their days in Knoxville. Moses was gone when they arrived but his wife kept their identity secret from her other guests. What happened next varies somewhat from telling to telling. In some accounts the Harpes arranged to sleep apart, each with another traveler with the express purpose of killing the tavelers. In other tellings the only traveller was Major William Love, who shared a room with Big Harpe. Harpe became so enraged by the Colonel’s snoring that he smashed the colonel’s head with his tomahawk. In both versions the Harpes later murdered Mrs. Stegall and her infant son and burned down their house. The killing continued until they were tracked by a posse that included a vengeful Moses Stegall. The two Harpes abandoned the women and headed in different directions. The posse on horseback followed Big Harpe. Here is the variation noted by Judge Hall. In some accounts the Harpes inadvertently exchanged horses in the chaos. Big Harpe, who thought he was on his extremely strong and powerful horse, was actually riding his cousin’s weaker animal. Confident he could outrun the posse, Big Harpe stayed on horseback when it would have been better to dismount and take to the trees. Others say Big Harpe was simply outrun by the posse. John Leiper, a friend of Moses Stegall, overtook Harpe and shot him through the back. Big Harpe tried to fire back but his rifle misfired. He fought on with his tomahawk until he was overpowered. Before he died Big Harpe confessed to 18 murders and only regretted one of them. When his infant daughter would not stop crying he bashed her head against a tree and killed her. Moses Stegall shot him through the heart then cut off his head with his hunting knife. The dismembered body was left in a spot near the town of Graham, Kentucky, still known as Harpe’s Hill. The head of Big Harpe was paced in the fork of a tree near Highland Lick. Today the spot is marked by a Kentucky highway marker on Route 41A north of Dixon, Kentucky. Little Harpe fled to Mississippi where he joined a band of river pirates led by Samuel Mason. Mason had a price on his head as well, and when he found himself alone with Mason, Little Harpe murdered him and cut off his head. He took the head to the authorities to collect the reward. The head was recognized right away as that of the outlaw Samuel Mason but the bearer was also instantly recognized as Little Harpe. Harpe was arrested in Mississippi where he was tried, convicted and executed for murder. The Harpe women were still in custody in Kentucky. Sally claimed she did not know that her husband Wiley was bad until she moved in with him. But, like the other women, she had several chances to take the children and leave. All three women always went back to Big and Little Harpe. The women were acquitted of murder. Susannah and Betsy settled in Logan County, Kentucky. Susannah eventually remarried. Sally went back to her father, then remarried and moved to Illinois. Big Harpe confessed to 18 murders, but the Harpe brothers are known to have murdered at least 25 people and some estimates place the total as high as 40. Though they made their living by theft, they murdered out of hatred for their fellow man. 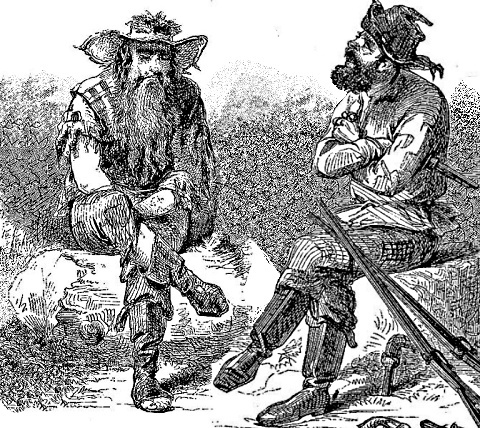 Big and Little Harpe could well be America's first recorded serial killers.